Carrickfergus Museum's education sessions all underpin the requirements of the Northern Ireland Curriculum. Most of our workshops are aimed at KS2, though can be adapted as required. All of our workshops involve activities that support the World Around Us- Exploring the Locality (Where I Live); PDMU (appreciation of the past, experience of others and a sense of where they belong) and WAU strands- Place and Change over Time. The sessions seek to foster the development of the following skills: Managing information, working with others, communication and thinking skills. Learning experiences are enquiry based, making links between curriculum areas and take place in a supportive and engaging learning environment. The activities for each session seek to foster curiosity, openness to new ideas and community spirit. Educational and fun apps such as Kahoot! and Morfo booth have been incorporated into all of our existing programmes allowing your students to interact and engage with the museum collections and the town’s history to provide meaningful learning experiences that will meet your needs. We offer the following workshop programmes, however, we are happy to tailor programmes where possible. In this session, pupils will become archaeologists and discover some genuine prehistoric artefacts. Through the "dig" the pupils learn how archaeologists piece together the past. Pupils will look at the Prehistoric section of the museum and explore a range of real and replica items allowing pupils to learn more about the differences between the Mesolithic and Neolithic periods. The session also consists of an interactive presentation, role-play and hands-on activities such as tomb building as well as a fun interactive plenary session. In this session, pupils are taken on an emotional journey to discover the thoughts and feelings of Second World War evacuees. Pupils will investigate both genuine and replica World War II items and take part in rationing activities such as deciding how to spend their clothing coupons. Pupils will gain knowledge of life during the Second World War in Northern Ireland through an interactive presentation, role-play and hands-on activities as well as a fun interactive plenary session. In this session, pupils are taken on a journey to discover what life was like for a real-life Carrickfergus Victorian Family and their staff. Pupils visit the Victorian section of the museum and undertake activities to explore the artefacts, including Mrs Weatherup’s wedding dress. Through interactive presentations, handling real objects, role-playing and a fun interactive plenary session, pupils will be able to make comparisons between the Victorian era and their own time. In this session, pupils will follow in the footsteps of Medieval ancestors by taking a walking tour of Carrickfergus’s ancient streets to hear how the town grew up around its magnificent Norman Castle. The tour takes in the medieval harbour area, the site of the medieval kiln at the end of West Street, Market Place (site of Great Patrick Cross) and High street, before reaching the site of the Franciscan Friary which now houses the town’s Museum. Pupils will then tour the museum and be able to handle various items relating to the industries of the town. In this session, pupils learn how the museum’s 1903 Merryweather fire engine was used and will make comparisons between this horse-drawn engine and a modern one. Pupils will explore the work of the fire service then and now, through stories, songs, role play activity sheets and craft. This session can be augmented by a visit from local firefighters with their engine. Find out how our ancestors lived in Medieval Carrickfergus. Using a range of visual aids including our new 3D Medieval Model of Carrickfergus, pupils will learn what Carrickfergus was like and look at the variety of buildings that would have been in the town and the types of people who lived in them. Also have a go at making the tallest tower house you can! This session can incorporate storytelling, song and dance and object handling. 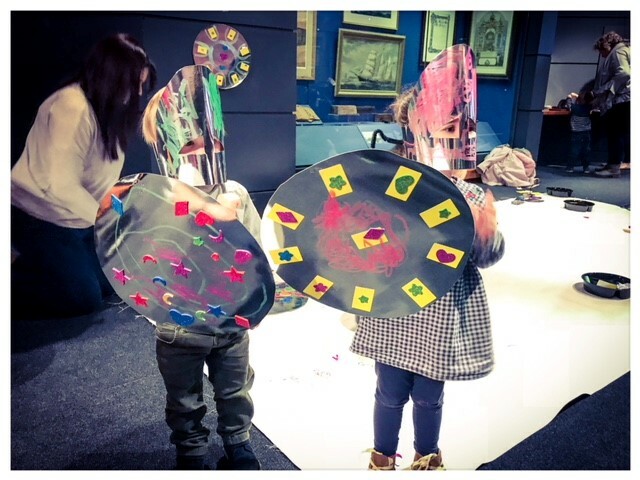 Book your class for a fun, interactive gallery trail around the museum. Using the museum’s iPads, pupils are invited to discover the history of the town and the artefacts on display for themselves through our interactive gallery trail, which includes images, videos and sounds. Trails available focusing on Medieval and Victorian Carrickfergus. Object handling session (real & replica) also included. This tour gives pupils a glimpse into Carrickfergus’ long and fascinating past. Carrickfergus history is one of trade and prosperity but also one of siege and warfare, which is told through the objects seen on display. Pupils are taken on a journey through the ages to find out how the town grew up around its magnificent Norman castle. Pupils get to view artefacts from Mesolithic, Norman, Elizabethan, Victorian and 19th century from the area as well as handle a range of real and replica items. A very long time ago in medieval times, a very special Barbary ape called Micah came all the way from Africa to live with the monks in the Carrickfergus Friary. Today the Carrickfergus Museum now stands where Micah once lived and Micah can still be spotted swinging around the place. Can you find all his hiding places? Object handling included. In this session, pupils will discover the differences between homes in the past and modern homes today. Pupils will also gain knowledge of what life would have been like for an Ulster-Scots family in the 18th Century at the Andrew Jackson Cottage. This session is very interactive, pupils gain knowledge by handling replica artefacts and role play. Worksheets can also be provided for the school classroom. This workshop uses the KS2 WWII and the Armed Forces theme to explore the origins of the elite commando unit, the US Rangers, formed in Carrickfergus in 1942. Delivered in the newly refurbished exhibition space, this session will introduce WWII and what people in the armed forces do, before discovering how the Rangers came into existence. Pupils will watch film footage of veteran Ranger Bob Reed, plus original WWII footage, to discover what it took to become a Ranger. Pupils will also have a chance to handle real WWII artefacts and complete a gallery trail. The museum now offers Early Years sessions that support the pre-school curriculum with learning through play. Each 50-minute session will foster communication skills and creativity through sensory, hands-on activities including storytelling, music, and crafts. All of these sessions are all available at any time throughout the academic year and should be booked in advance. Cost per pupil: £1.50 per head. Visits in conjunction with the castle will continue to be free of charge. Early Years sessions are also currently free of charge. Contents include Victorian artefacts, teachers’ notes and worksheets complete this loan box experience. Contents include a selection of wartime artefacts, teachers’ notes and worksheets complete this loan box experience.